The Cool House: Healthy Eating? Okay, this is an absolutely hysterical post from the NY Times Blogs. 1. Beets: Think of beets as red spinach, Dr. Bowden said, because they are a rich source of folate as well as natural red pigments that may be cancer fighters. 2. Cabbage: Loaded with nutrients like sulforaphane, a chemical said to boost cancer-fighting enzymes. 3. Swiss chard: A leafy green vegetable packed with carotenoids that protect aging eyes. 4. Cinnamon: May help control blood sugar and cholesterol. 5. Pomegranate juice: Appears to lower blood pressure and loaded with antioxidants. 6. Dried plums: Okay, so they are really prunes, but they are packed with antioxidants. 7. Pumpkin seeds: The most nutritious part of the pumpkin and packed with magnesium; high levels of the mineral are associated with lower risk for early death. 8. Sardines: Dr. Bowden calls them “health food in a can.” They are high in omega-3’s, contain virtually no mercury and are loaded with calcium. They also contain iron, magnesium, phosphorus, potassium, zinc, copper and manganese as well as a full complement of B vitamins. 9. Turmeric: The “superstar of spices,” it may have anti-inflammatory and anti-cancer properties. 10. Frozen blueberries: Even though freezing can degrade some of the nutrients in fruits and vegetables, frozen blueberries are available year-round and don’t spoil; associated with better memory in animal studies. 11. Canned pumpkin: A low-calorie vegetable that is high in fiber and immune-stimulating vitamin A; fills you up on very few calories. It was first published back in June 2008 and they re-published it this weekend. It's funny not only because the suggestion for incorporating two of the 11 Best Foods You Aren't Eating into your diet is to add butter and proscuitto to them. I mean, what food doesn't taste better wrapped in pieces of pig or slathered in butter? But it's the comments that slay me. These - all 54 pages of them - are brilliant. 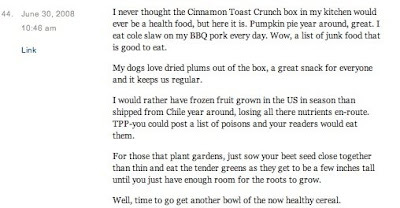 Well, we eat all these foods except #11, (canned pumpkin? Yak!) regularly and I really don't think we're "healthier" than any of our friends or neighbors. But I do have a suggestion for #5. Mix with vodka and garnish with a few #10s.